Huge Savings Item! Save 19% on the Ilford Multigrade FB Classic Matte Variable Contrast Paper (5 x 7'', 100 Sheets) by Ilford at EISF. MPN: 1172203. Hurry! Limited time offer. Offer valid only while supplies last. ILFORD MULTIGRADE FB CLASSIC has been designed for the creative printer wanting neutral image colour, great clarity and a good response to toners. 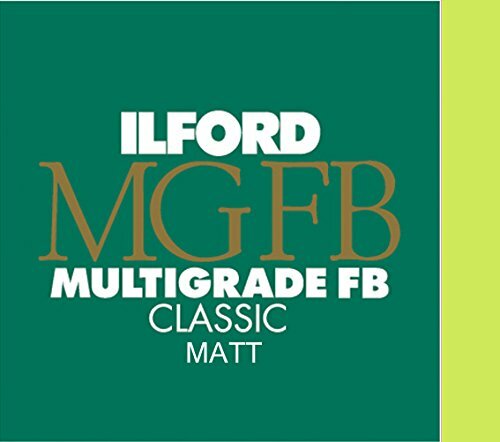 ILFORD MULTIGRADE FB CLASSIC has been designed for the creative printer wanting neutral image colour, great clarity and a good response to toners. This is a premium quality, variable contrast, black and white photographic paper, coated onto a 255g/m2 fibre base. View More In Photo Enlarging Paper. If you have any questions about this product by Ilford, contact us by completing and submitting the form below. If you are looking for a specif part number, please include it with your message. Fujifilm Fujicolor Crystal Archive Super Type II Color Enlarging Paper - 8x10"-100 Sheets - Lustre Surface.